Sunshine. Princesses. Smiles. Kisses. Hugs. Cotton Candy. Spunky. Determined. Dancing. Singing. Daddy’s girl. All of those words (and more), describe Anna Charles Hollis, known as “AC” to many who loved her. After a routine tonsillectomy, six-year-old Anna Charles’ health began to deteriorate. Severe knee and back pain drove her family to the emergency room where on April 15 they were devastated by the news that Anna Charles had acute myeloid leukemia (AML). Three days after her diagnosis, a mass of AML cells was discovered on her spine. She had emergency surgery to remove the mass, but it left her spine in shock – causing her to become paralyzed from her lower chest down. After four rounds of chemo, Anna Charles relapsed and began preparing for radiation and a bone marrow transplant. Unfortunately, her body began to shut down before the transplant could be scheduled. On September 16, 2018, Anna Charles passed away with many friends and family members by her side. After a routine tonsillectomy, six-year-old Anna Charles’ health began to deteriorate. 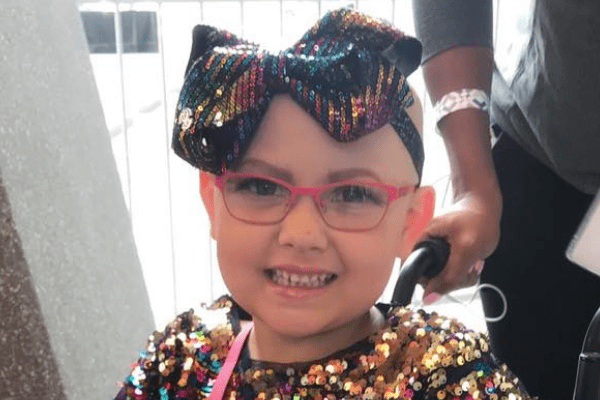 Severe knee and back pain drove her family to the emergency room where on April 15 they were devastated by the news that Anna Charles had Acute Myleoid Leukemia (AML). Three days after her diagnosis, a mass of AML cells was discovered on her spine. She had emergency surgery to remove the mass, but it left her spine in shock – causing her to become paralyzed from her lower chest down. After four rounds of chemo, Anna Charles relapsed and began preparing for radiation and a bone marrow transplant. Unfortunately, her body began to shut down before the transplant could be scheduled. On September 16, 2018, Anna Charles passed away with many friends and family members by her side. The primary purpose of The Anna Charles Hollis Fund is to fund clinical research relating to acute myeloid leukemia (AML) or research reasonably expected to provide significant and direct benefits to children diagnosed with AML.